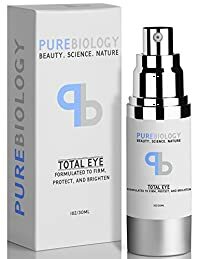 Specifics/Features — All-purpose anti aging eye cream.. Lightweight.. Ultra-fast absorbing.. Non-greasy.. Non-GMO.. Fragrance free.. Clinically proven and time-tested ingredients.. Provides immediate and lasting benefits.. Visible results start with the first application.. Reduces fine lines, wrinkles, puffiness, bags and dark circles.. Protects under eye skin from UV rays.. Suitable for use under make-up..